Will the Budget break property sentiment? To understand what they’re about, we can turn to a similar historical period. In 2003 the RBA confronted a relatively weak economy following the dot-com bust but a runaway property bubble in Sydney. To combat it, the then Macfarlane RBA set about popping the bubble without crashing the economy by launching a major jawboning assault on investors combined with a couple of short and sharp rate hikes. They succeeded in doing a lot more damage to sentiment than they did actual monetary tightening which helped mitigate the fallout. Significantly, this approach was based upon research by a junior governor name Phil Lowe, who had several years earlier penned BIS research arguing that bubbles ought to be dealt with up front, not afterwards, as was the orthodoxy under Alan Greenspan. Contrast that with today and I think we can see the same methodology being employed by the Council of Financial Regulators. In the past few days we have had ASIC, the RBA and APRA all jawboning their butts off about the bubble, about household debt and about dodgy lending. They have also tightened macroprudential across a a number of metrics. All three are at it again today. The RBA thinks that the worst of the mining bust is behind us so now is as good a time as any to blow the froth off the bubble. Moreover, these guys do not innovate, they go by an established play book. And given the 2003 Sydney bust had its victims but was manageable overall they will reason that it can be done again without crashing the system. Especially so as long as immigration continues to run hot and the global economy to improve. This campaign has continued since with the regulators and Treasurer reminding specefestors regularly that the jig is up. Now in May we’ve also seen a big hit on interest-only lending rates which we can probably say represents another rate hike in psychological (if not actual) terms. This time last year, the index was at 135 and accelerating. It is now at roughly 115 and tanking. 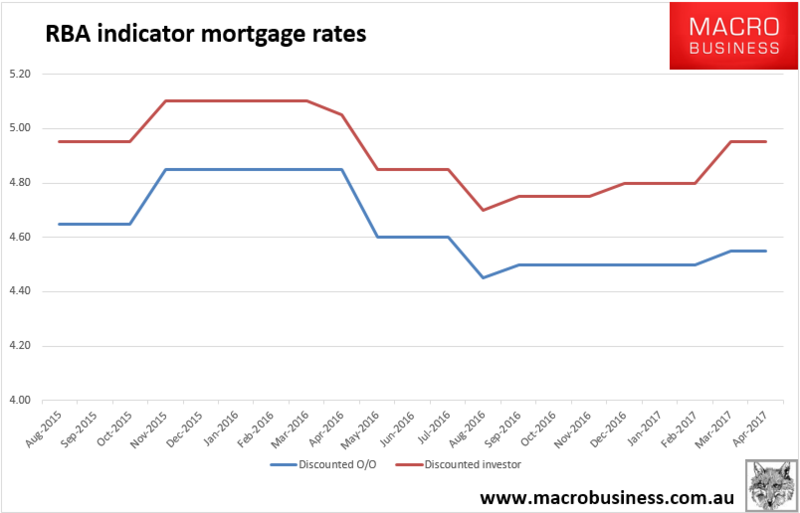 The 20 point year on year fall is now bigger than the impact we saw from the first round of macroprudential which took house price growth close to zero. the ASX has topped out. UBS analyst Jonathan Mott warned the $6.2bn bank levy could hurt growth if lenders resorted to passing on costs to customers. He said the introduction of the levy is likely to prompt the sector to hike mortgage rates, adding further pressure to the economy as regulators force the banks to move borrowers to principle and interest loans, rather than riskier interest-only loans. On the positive side, the infrastructure stimulus will be well-received, immigration is untouched for now and the negative gearing reforms were modest. On balance, however, the Budget is house price negative versus yesterday. We are close to prices rolling over.